One of my favorite perks of my job is supporting local makers and providing a platform to help launch their business. Plus, I get a sneak peek at some really AWESOME products that I get introduce to YOU, my amazing customers. And when it's a customer that is the maker... even better! Which is why I am thrilled to be the first venue to show off my friend Kathy Blomfield's new business... Wonderfully Made! "My mother taught me to sew when I was a young girl. I love to sew and create lovely things for my house and gifts for others. 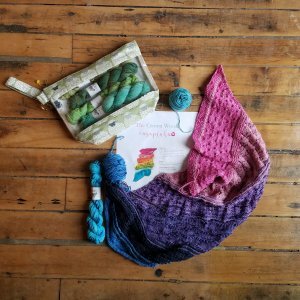 When I saw how much knitters and crocheters love their project bags, I decided that I could create these beautiful bags for knitters. I also created cases for organizing knitting needles. There is nothing worse than not being able to find your supplies. The yarn bowls are created on my sewing machine using a zigzag stitch. They are so fun to make and so fun to use. They are perfect for holding your yarn while you knit a beautiful project. I am so excited to have this business and to be able to share my creations with you." Please join us this Saturday to view her collection and support a local maker and friend! 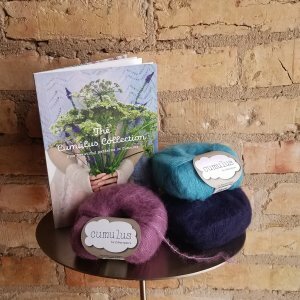 More luscious alpaca/silk yarn from Fyberspates, Cumulus, is here for your enjoyment. This fluff is stunning by itself, double stranded or held with another strand. AND, there's a brand new collection of designs that feature this fluffy yarn. Get in soon to squish some! I have been eyeballing this yarn from Wool Addicts for a sweater since it arrived in the Garden. It's called Water, and it's 100% alpaca, spun to have a crimped, fluffy texture. 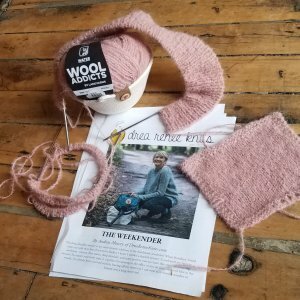 I settled on The Weekender by Andrea Mowry, and have swatched and started the ribbing. It's so squishy and soft, I can't to wear it! I'm also stitching on The Crown Wools MKAL from Casapinka. The yarn I'm using is AJHC Wools Basic Sock Minis, and I chose my colors based on my family's birthstones. I'm calling this my mother's wrap. It's great for a quick pick-me-up between other projects, and the different stitch patterns are so refreshing to play with. 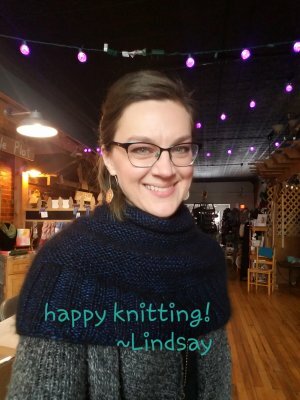 The cowl I am wearing is knit out of Cascade Luminosa, and it's called Getting Warmer. It's a freebie on Ravelry, and I LOVE the warmth, softness, and shine of this yarn. All the colors are a rich, jewel tone with a pretty shimmer, and it adds a lovely touch to the simple design.